DO SELF-PRESENTATION TACTICS MEDIATE THE RELATIONSHIP BETWEEN SELF-REGULATORY ORIENTATIONS AND PROBLEMATIC INTERNET USE? Problematic Internet use has been an important topic for researchers. Though, (problematic) Internet use is a motivated action, underlying motivations are largely unexamined. 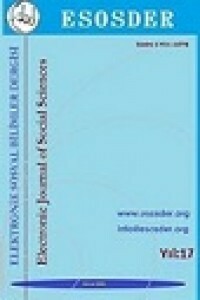 Therefore, in the current study, effects of self-regulatory orientations (i.e., promotion and prevention self-regulatory foci) with the mediating role of self-presentation tactics on problematic Internet use was examined on 225 university students who use the Internet mostly for social network sites (SNSs). Portrait Values Questionnaire was used to determine participants’ self-regulatory orientations (prevention focus and promotion focus). Self-Presentation Tactics Scale was used to determine the type of mainly used tactics (defensive and assertive) on SNSs. Problematic Internet Use Scale was used to determine the consequences of their Internet use. Results revealed that neither prevention focus, nor promotion focus orientations directly predict problematic Internet use. As expected, defensive self-presentation tactics mediate the relationship between promotion focus and problematic Internet use. Therefore, focusing on gains –rather than a loss- on the SNSs leads to more defensive self-presentation tactics which in turn leads to problematic Internet use. Problemli internet kullanımı araştırmacılar için önemli bir konu olagelmiştir. Ancak, (problemli) internet kullanımı motivasyonel bir davranış türü olmasına ragmen, altında yatan motivasyonel süreçler genel olarak incelenmemiştir. Bu sebeple, bu çalışmada, interneti çoğunlukla sosyal medya siteleri için kullanan 225 üniversite öğrencisinin problemli internet kullanımları, benlik düzenleme odaklarının (yaklaşmacı ve kaçınmacı odak) kendini sunumlama taktikleri (savunucu ve girişken) üzerinden aracı etkisiyle incelenmiştir. Benlik düzenleme odağını ölçmek için Portrait Değerler Anketi, kendini sunumlama taktikleri için Öz-Sunum Taktikleri Ölçeği ve internet kullanımı için Problemli Internet Kullanımı Ölçeği kullanılmıştır. Bulgular, ne yaklaşmacı ne de kaçıncaı odağının problemli internet kullanımı üzerinde doğrudan bir etkisnin olmadığını göstermiştir. Ayrıca, beklendiği üzere, savunucu kendini sunumlama taktiklerinin yaklaşmacı odak ile problemli internet kullanımı arasında aracı etkisi olduğu gözlenmiştir. Buna göre, sosyal medya sitelerinde kayıplardan çok kazanımlara odaklanmanın daha savunucu taktikler kullanılmasına yol açtığı, bunun da internetin daha problemli kullanılmasına neden olduğu görülmüştür. Arkin, R. M. (1981). Self-presentation styles. In J. T. Tedeschi (Ed. ), Impression management theory and social psychological research. New York: Academic Press. Beard, K. W. (2005). Internet addiction: A review of current assessment techniques and potential assessment questions. Cyber Psychology & Behavior, 8, 7-14. Carver, C. S. (2004). Self-regulation of action and affect. In R. F. Baumeister & K. D. Vohs (Eds. ), Handbook of Self-regulation: Research, theory and application (pp.13-39). New York: Guilford R.
Ceyhan, A. A. (2011). University students‘ problematic Internet use and communication skills according to the Internet use purposes. Educational Sciences: Theory & Practice, 11(1): 66-77. Ceyhan, E., Ceyhan, A. A., & Gurcan, A. (2007). The validity and reliability of the problematic Internet usage scale. Educational sciences: Theory & Practice, 7(1): 411-416. Chen, Y., Wen, Z., & Ye, M. (2017). Exploring profiles of work regulatory focus: A person-centered approach. Personality and Individual Differences, 116(1): 16-21. Chun, J. (2016). Effects of psychological problems, emotional dysregulation, and self-esteem on problematic Internet use among Korean adolescents. Children and Youth Services Review, 68, 187-192. Fabiansson, C. (2007). Young people's perception of being safe - globally & locally. Social Indicators Research, 80(1):31-49. Förster, J., & Higgins, E. T. (2005). How global versus local perception fits regulatory focus. Psychological Science, 16, 631-636. Freitas, A. L., & Higgins, E. T. (2002). Enjoying goal-directed action: The role of regulatory fit. Psychological Science, 13, 1-6. Gunuc, S., & Kayri, M. (2010). The profile of internet dependency in Turkey and development of internet addiction scale: study of validity & reliability. H. U. Journal of Education, 39, 220-232. Heine, S. J., Takata, T., & Lehman, D. R. (2000). Beyond self-presentation:Evidence for self-criticism among Japanese. Personality and Social Psychology Bulletin, 26, 71-78. Higgins, E. T. (1997). Beyond pleasure and pain. American Psychologist, 52(12): 1280-1300. Higgins, E. T. (2000). Making a good decision: Value from fit. American Psychologist, 5, 1217-1230. Hong, J., & Lee, A. Y. (2008). Be fit and be strong: Mastering self-regulation through regulatory fit. Journal of Consumer Research, 34, 682-695. Idson, L. C., & Higgins, E. T. (2000). How current feedback and chronic effectiveness influence motivation: Everything to gain versus everything to lose. European Journal of Social Psychology, 30, 538-592. Jones, L. M. (2012). Trends in youth Internet victimization: Findings from three youth internet safety surveys 2000-2010. The Journal Of Adolescent Health, 50(2):179-86. Johnson, P. D., Smith, M. B., Wallace, J. C., Hill, A. D., & Baron, R. A. (2015). A review of multilevel regulatory focus in organizations. Journal of Management, 41(5): 1501-1529. Kacmar, K. M. & Tucker, R. (2016). The moderating effect of supervisor‘s behavioral integrity on the relationship between regulatory focus and impression management. Journal of Business Ethics, 135, 87-98. Kandell, J. (1998). Internet addiction on campus: The vulnerability of college students. CyberPsychology & Behavior, 1, 46–59. Kluger, A. N., Yaniv, I., & Kühberger, A. (2001, February). Needs, self-regulation, and risk preference. Paper presented at the 2nd Annual meeting of the Society of Personality and Social Psychology, San Antonio, Texas. Kruglanski, A. W., Shah, J. Y., Fishbach, A., Friedman, R., Chun, W. Y., & Sleeth-Keppler, D. (2002). A theory of goal systems. In M. P. Zanna (Ed. ), Advances in Experimental Social Psychology, (pp. 331-378). San Diego, CA: Academic Press. Laconi, S., Vigouroux, M., Lafuente, C., & Chabrol, H. (2017). Problematic internet use, psychopathology, personality, defense and coping. Computers in Human Behavior, 73, 47-54. Lam, L. T. & Lam, M. K. (2016). eHealth intervention for problematic Internet use (PIU). Current Psychiatry Reports, 18(107): 1-7. Langens, T. A. (2007). Regulatory focus and illusion of control. Personality and Social Psychology Bulletin, 33, 226-237. Lee, S., Quigley, B. M., Nesler, M. S., Corbett, A. B., & Tedeschi, J. T. (1999). Development of a self-presentation tactics scale. Personality and Individual Differences, 26(4): 701–722. Leikas, S., Lönnqvist, J. E., Verkasalo, M., & Lindeman, M. (2009). Regulatory focus systems and personal values. European Journal of Social Psychology, 39, 415–429. Meerkerk, G. J., Van Den Eijnden, R. J., Franken, I., & Garretsen, H. (2010). Is compulsive internet use related to sensitivity to reward and punishment, and impulsivity? Computers in Human Behavior, 26(4): 729–735. Morahan-Martin, J., & Schumacher, P. (2000). Incidence and correlates of pathological Internet use among college students. Computers in Human Behavior, 16(1): 13-29. Mourali, M., Bockenholt, U. & Laroche, M. (2007). Compromise and Attraction Effects Under Prevention and Promotion Motivations. Journal of Consumer Research, 34(2):234-247. Overup, C. S., Brunson, J. A., & Acitelli, L. K. (2015). Presenting different selves to different people: self-presentation as a function of relationship type and contingent self-esteem. The Journal of General Psychology, 142(4): 213–237. Pollack, J. M., Förster, W. R., Johnson, P. D., Coy, A., & Molden, D. C. (2015). Promotion- and prevention-focused networking and ıts consequences for entrepreneurial success. Social Psychological and Personality Science, 6(1): 3-12. Preacher, K. J. & Hayes, A. F. (2008). Asymptotic and resampling strategies for assessing and comparing indirect effects in multiple mediator models. Behavior Research Methods, 40 (3): 879-891. Righetti, F., Finkenauer, C., & Rusbult, C. E. (2011). The benefits of interpersonal regulatory fit for individual goal pursuit. Journal of Personality and Social Psychology, 101(4): 720-736. Rosenberg, J. (2009). Online impression management: Personality traits and concern for secondary goals as predictors of self-presentation tactics on Facebook (Master‘s thesis). Retrieved from https://etd.ohiolink.edu/rws_etd/document/get/kent1259197291/inline. Shah, J., Higgins, E. T., & Friedman, R. S. (1998). Performance incentives and means: How regulatory focus influences goal attainment. Journal of Personality and Social Psychology, 74(2): 285-293. Shokri, O., Potenza, M. N., & Sanaeepour, M. H. (2017). A preliminary study suggesting similar relationships between impulsivity and severity of problematic internet use in male and female Iranian college students. International Journal of Mental Health Addiction, 15, 277-287. Scholer, A. A., Stroessner, S. J., & Higgins, E. T. (2008). Responding to negativity: How a risky tactic can serve a vigilant strategy. Journal of Experimental Social Psychology, 44, 767-774. Schutz, A. (1998). Assertive, offensive, protective, and defensive styles of self-presentation: A taxonomy. The Journal of Psychology, 132, 611–628. Schwartz, S. H., Melech, G., Lehmann, A., Burgess, S., Harris, M., & Owens, V. (2001). Extending the cross-cultural validity of the theory of basic human values with a different method of measurement. Journal of Cross-Cultural Psychology, 32, 519-542. Tedeschi. J. T., & Norman, N. (1985). Social power, self-presentation and the self. In B. R. Schlenker (Ed. ), The self and social life (pp. 293–322). New York, NY: McGraw Hill. Tokunaga, R. S. & Rains, S. A. (2016). A review and meta-analysis examining conceptual and operational definitions of problematic Internet use. Human Communication Research, 42, 165–199. Walther, J. B. (1996). Computer-mediated communication: Impersonal, interpersonal, and hyperpersonal interaction. Communication Research, 23(3): 3-43. Walther, J. B., Van Der Heide, B., Kim, S., Westerman, D., & Tong, S. (2008). The role of friends‘ appearance and behavior on evaluations of individuals on Facebook: Are we known by the company we keep? Human Communication Research, 34, 28-49. Yi, S. & Baumgartner, H. (2009). Regulatory focus and message framing: A test of three accounts. Motivation and Emotion, 33, 435. Young, K. S. (1996). Psychology of computer use: XL. Addictive use of the Internet: A case that breaks the stereotype. Psychological Reports, 79, 899–902. Young, K. S. (1998). Internet addiction: The emergence of a new clinical disorder. Cyberpsychology & Behavior, 1, 237-244.